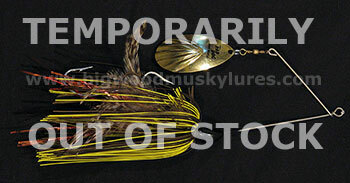 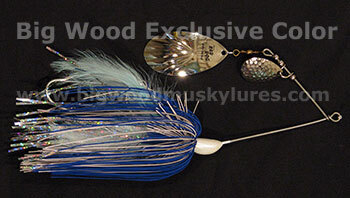 Description: The original Ruff Tackle Rad Dog is legendary for it's ability to Grind through the weeds and is listed by the Muskie’s Inc Lunge Log in the top 25 baits for 50” fish. 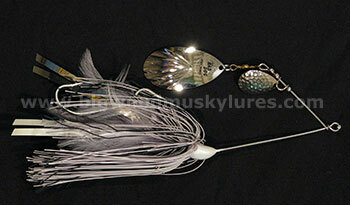 Now the same quality spinnerbait has a new twist. 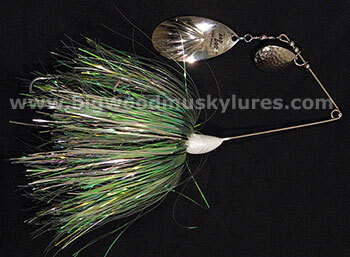 The Tinsel Dog has the same Grinding ability with the same Ruff Tackle toughness, but with eye-catching flashabou skirts! 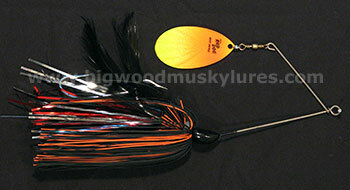 Heavily built using .062” stainless wire, forged 7/0 hooks and a #7 Fluted Indiana blade for flash and vibration. 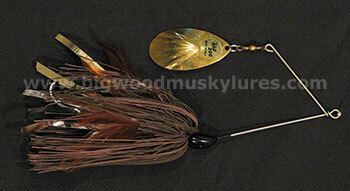 About 9", 2 1/4 oz head. 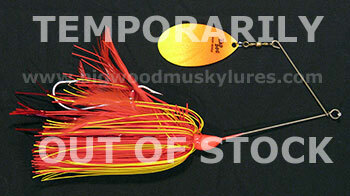 Description: Made for Big Fish. 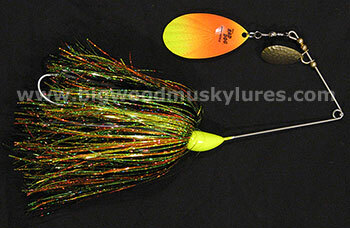 The Rad Dog Spinnerbait, by Ruff Tackle, is known for it's ability to grind through thick weeds. 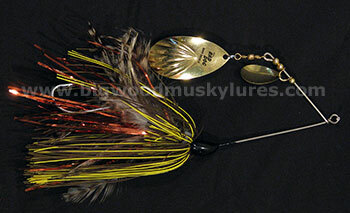 Fish the weeds with this spinnerbait to pull big Muskies and Northern Pike out of heavy cover. 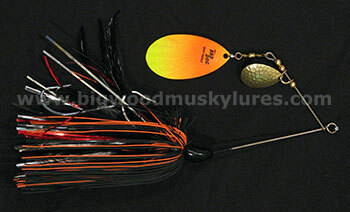 Built with .062 wire and forged 7/0 hook and 6/0 trailer, mylar flash, hackle feathers, and silicone rubber. 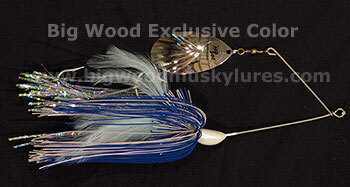 9", 1 5/8 oz. 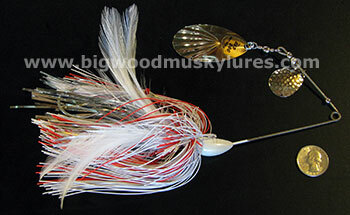 Description: Made for Big Fish. 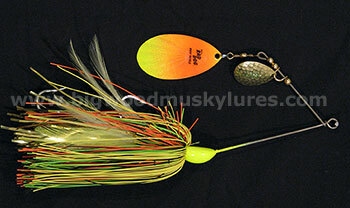 The Rad Dog Spinnerbait, by Ruff Tackle, is known for it's ability to grind through thick weeds. 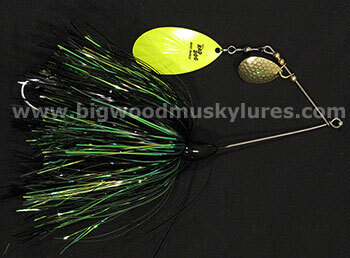 This Heavy Model casts farther fishes faster and deeper. 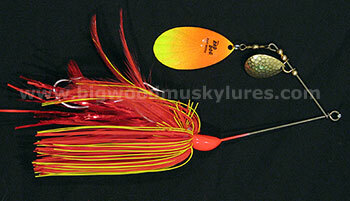 Fish the weeds with this spinnerbait to pull big Muskies and Northern Pike out of heavy cover. 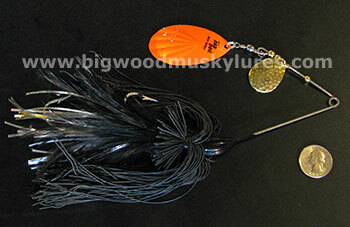 Built with .062 wire and forged 7/0 hook and 6/0 trailer, mylar flash, hackle feathers, and silicone rubber. 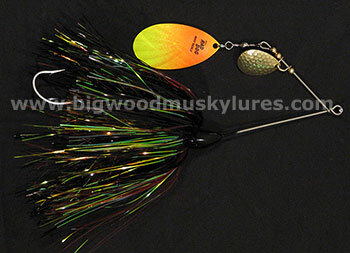 9", 2 1/4 oz.